The 25th Annual Avila Beach Blues Festival - Otter Productions Inc. | Otter Productions Inc. The 25th Annual Avila Beach Blues Festival - Otter Productions Inc. This is the 25th year for what has been a landmark Central Coast event, the Avila Beach Blues Festival. This year continues the tradition of the biggest and longest running blues festival on the Central Coast, with top name entertainment against the backdrop of the Pacific Ocean. 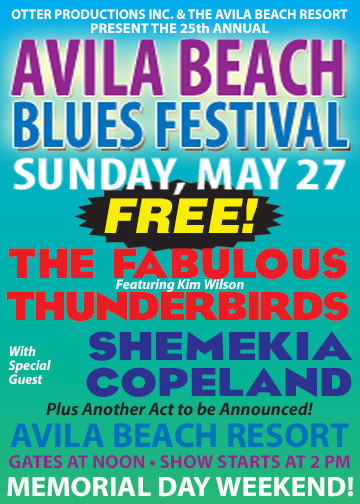 This is the greatest line-up of talent ever assembled for this festival… we are so proud this year to welcome Huey Lewis & The News as our headliner… The Fabulous Thunderbirds featuring Kim Wilson will return to the beach at Avila after a 15 year hiatus… and Central Coast favorite Shemekia Copeland opens the show! This is the party that kicks off the outdoor concert season! With VIP, Beach Club Balcony, reserved theater-style and table seating and General Admission Lawn tickets available for sale, this will be an afternoon concert, gates open at noon and the show will start at 2PM and continue until sunset. In the style of any great outdoor venue, you will be able to enjoy your favorite libation (adult beverages and premium beer and wine will be available for sale), snack (upgraded concert snacks available for purchase), watch world-class entertainment under the afternoon sky with your backdrop the Pacific Ocean. 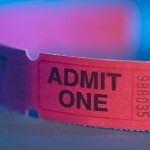 Advance Reserved and General Admission tickets will go on sale Friday, January 19th at Boo Boo Records in San Luis Obispo; on-line eventbrite.com; and scroll down to purchase on this site.. All Ages. 7 and under admitted free in Lawn Seating only when accompanied by paid adult, one child per one paid adult. Rain or Shine. Please no outside food or beverages. No pets. No umbrellas. Low-backed lawn chairs (2’ maximum back height) and blankets allowed in Lawn Seating only. No high-backed chairs will be allowed in venue. Paid parking available on-site. A portion of the proceeds to benefit the Rossi Foundation, a non-profit 501 C3 and the community charities it serves. Directions to Avila Beach Resort – Highway 101 to Avila Beach (just north of Pismo Beach, just south of San Luis Obispo). Take the Avila Beach Drive exit towards the ocean. Travel 2 ½ miles and you’ll see the Resort on your right. Doors are at Noon. Show starts just before 2PM. The approximate show times are: Shemekia Copeland 2PM – 3PM; Fabulous Thunderbirds featuring Kim Wilson 3:30PM – 4:45PM; Huey Lewis & the News 5:15PM – 6:45PM. Event Parking on the 10th Fairway. Parking fee included in your ticket price. No tailgating allowed. Any attendees consuming personal alcoholic beverages in the Parking Areas will not be allowed into the venue. There will be food and beverage for sale at the venue. No outside food or beverages will be allowed in the venue. Sealed plastic water bottles will be allowed. There will be water for available for free and bottled water available for purchase. No ice chests, picnic baskets, etc. All purses, bags, and backpacks are subject to search. Management is not responsible for any confiscated items. There will be a Golden Circle Reserved Area with chairs closest to the stage. The Golden Circle will include VIP seating (first 4 Rows, Center Section), theater seating (2 price levels), and Table Seating (2 price levels). There will also be (G/A) General Admission Lawn Seating. Okay to bring blankets and low-backed chairs (less than 2’ high) into General Admission Lawn area. Ask about our new “Premier Beach Club Balcony” area… premier 2nd story balcony viewing, appetizers, VIP no host bar, private restrooms, indoor G/A seating and outdoor Standing Room Only. Blankets and Low-Backed Chairs (under 2’) will be allowed in G/A only. No High-Backed Chairs will be allowed. No umbrellas. No one will be allowed into the venue prior to doors. Early comers will wait in line. First come first served. No in and outs. That means, once you’re in the venue, you can’t leave and return again for free. If you need anything else during the day (diapers, medication, jacket), bring them into the venue. No pets. Please do not bring your pet and leave them in the car. It may be hot. Children 7 and under are free when accompanied by paid adult in Lawn Seating only, one child per one paid adult. FREE TO THE PUBLIC. UNDER 18 MUST BE ACCOMPANIED BY ADULT. GATES ARE AT NOON. COME EARLY. FIRST-COME, FIRST-SERVED. VIP UPGRADES TO BEACH CLUB BALCONY AVAILABLE. USE TICKET LINK BELOW.